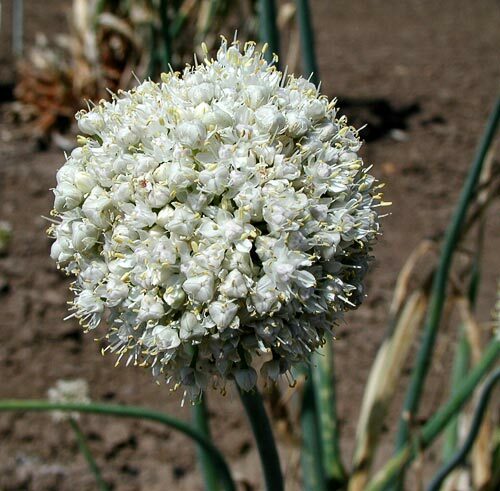 AgroAtlas - Relatives - Allium galanthum Kar. et Kir. - Snowdrop onion. Allium galanthum Kar. et Kir. - Snowdrop onion. Family Alliaceae J.Agardh genus Allium L.
Herbaceous, perennial, bulbous plant. Attached to rhizome in groups, bulbs are conical-cylindrical with thin-skinned, un-split, red-brown tunics. Stem is vigorous, 20-50 cm tall, solid, gradually tapering towards the top, clad in smooth leaf sheaths at the bottom. Leaves are 2-(3) in number, cylindrical, gradually tapered towards the top, fistular, 3-10 mm wide, 1-2 times shorter than the stem. Umbel is hemispheric or, more frequently, globular, polyanthous, more or less dense. Tepals are white with a barely visible vein, 4-5 mm long, equal in size, oblong, obtuse. Filaments are scarcely longer than the perianth. Blossoms in July. Entomophilous. Propagated by seeds and bulbs. 2n=16. Middle Asia (Near-Balkhash, Dzungarian-Tarbagatai, Tien Shan regions); Northwestern China (Xinjiang). Grows on gravelly and stony slopes from the low mountains to the middle mountain zone. For food (vegetable) and as a source of vitamins. It is an excellent table onion, readily gathered by the local population. © I.G. Chukhina, T.A. Sinitsyna.